SMT Wire Drawing Machines are most suitable and known for their performance in field of wire drawing. Graded casted parts are mounted on steel fabricated frame to bear maximum load. Branded bearings are used in our Horizontal Wire Drawing Machine. As well, the Horizontal Wire Drawing Machines are equipped with strong automatic clutch which is most suitable for its specific purpose. SMT Wire Drawing Machines are built to exact requirement with full range in wire drawing line having a quick way to solve all problems in drawings. 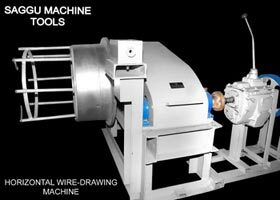 The Horizontal Wire Drawing Machine can be availed at market-leading price from us. We are a prominent name as Horizontal Wire Drawing Machine Manufacturer, Exporter and Supplier in Punjab (India).